Proposal: Demolition of existing Sports Pavilion and Store and erection of replacement building comprising new Community Hall, new WC and storage facilities, new changing facilities and replacement Sports Pavilion, plus parking and external works. 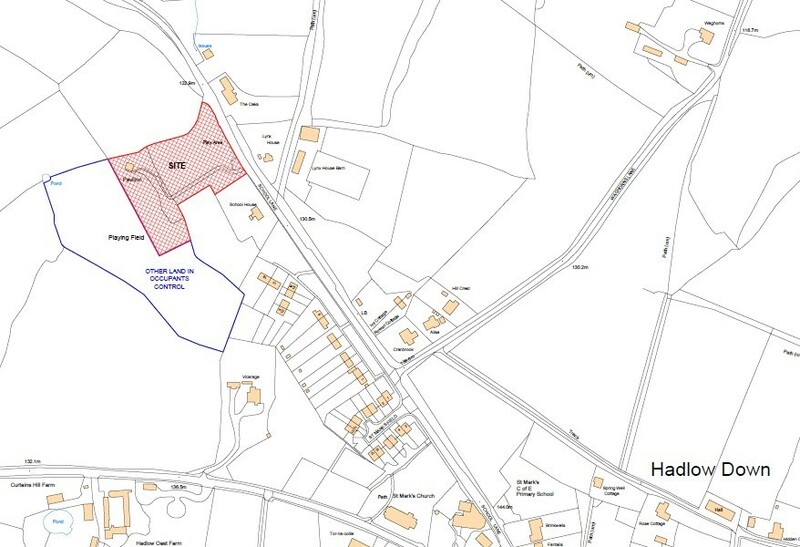 The application site lies on the north-western edge of Hadlow Down village, on the western side of School Lane. The applicants are Hadlow Down Parish Council who own the land occupied by the playing fields. This scheme has been prepared in conjunction with the Hadlow Down Village Hall Committee. The existing site features a marked-out cricket pitch served by the current Pavilion facilities, plus a recently re-formed football pitch area. A small children’s play area has been formed close to the site entrance, with a small number of fixed items of play equipment and a small zip wire. A small parking and turning area has been formed to accommodate up to about 10 vehicles. The existing Hadlow Down Village Hall building is currently situated at the bottom of Hut Lane, close to the centre of the village. The building has been on this site since 1921, having been obtained and relocated from the YMCA. Although it has been improved and refurbished throughout the 20th Century, most notably during 1965 when the original timber-framed building was reconstructed as the brick-built structure present today, but it has now reached the end of its service life. In 2008, Hadlow Down Parish Council started the process of investigation of the provision of a replacement Community Centre for the village and in 2010 a working group was formed to consider a more detailed appraisal of the scheme. The Village Hall Committee was formed and following various public consultation from 2011 to the present date, the replacement scheme which is now the subject of this application has evolved. It could be argued that the original building could be extended and indeed it was subject to a successful Permitted Development application under WD/2014/0347/LDP to extend the building by a further 55m2. However, this was never implemented, primarily due to the fact that it still provided limited improvement but had a serious effect upon the amount of parking and turning area available. Whilst at the end of its service life, the current building does provide valued functions as a community gathering space and recreational facility. Various Clubs and Societies are based at the building, including the Amateur Dramatic Society, Horticultural Society and Short Mat Bowls Club. In addition to this, various dance and exercise classes use the main hall and a weekly meeting group for the over 60’s known as the TN22 Club. The facilities offered by the hall are extremely limited for all of these groups. The building lacks WC and welfare facilities commensurate with a modern hall and in particular, the facilities created for compliance with disabled access and use regulation are at best rudimentary. The building lacks storage space and the hall itself is not of proportions suitable for certain user groups and therefore its functionality to the wider community is compromised. Whilst reasonably located for the centre of the village and pedestrian access, the building severely lacks proper vehicular access and parking facilities and all roads and approaches to the site are largely unmetalled, meaning that access for all user groups, most notably those with mobility issues can prove to be a challenge. Hadlow Down Parish Council and the Hadlow Down Village Hall Committee have sought to provide a solution to the problem of providing the much-needed improvements to the facilities for existing user groups and to enable others who cannot currently use the building to enjoy facilities perhaps taken for granted in other similar villages within the district. Moreover, the need to replace the dilapidated Sports Pavilion at the playing field site means that the need to address the quality of the community use buildings within the village is extremely pressing. 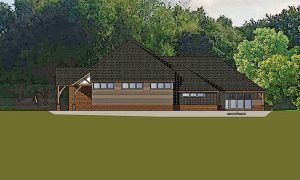 Following the completion of an outline design brief plus in 2015, the Hadlow Down Community Centre Committee appointed this Practice to prepare preliminary designs for a building to encompass the provision of a new Community Hall, plus a replacement of the Sports Pavilion on the playing fields site. 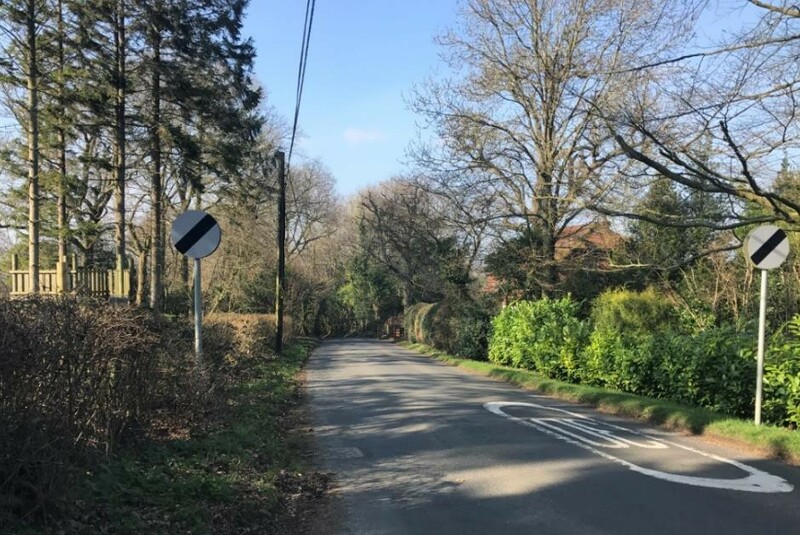 This work was undertaken during 2017 and has culminated in the completion of two further public meeting and consultation exercises and a detailed Pre-Application Advice process with Wealden District Council – see later. 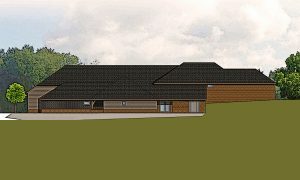 The facilities proposed under this application will effectively replace those currently provided for within the existing Village Hall and Sports Pavilion, albeit that in both cases they will now be furnished with the requisite WC, changing facilities, welfare facilities and storage, commensurate with a modern Community Hall, fully compliant with the requirements of Sport England. Furthermore, the project will encompass the provision of parking facilities suitable for a building of its size and a complete range of access, parking, welfare and user facilities for disabled groups with specific mobility and sensory issues. The requirement is to create a more usable hall space which is not significantly larger than the original Village Hall, but which provides for a greater of flexibility in use and most notably to create a more usable width of hall and a greater amount of clear headroom, thereby enabling a wider range of activities to take place within. 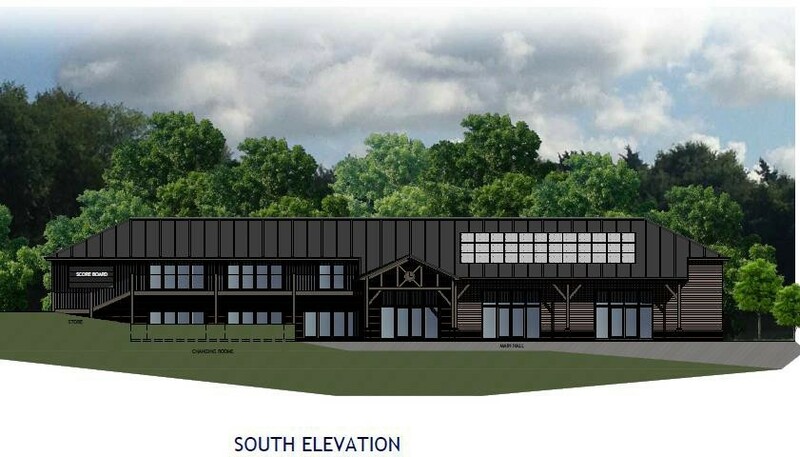 In replacing the Sports Pavilion, the opportunity exists to create proper changing facilities for home and visiting teams, plus match officials. The existing Pavilion does not provide facilities which are considered adequate at present and this severely restricts certain user groups, particularly the younger age groups who are subject to a number of safe-guarding requirements which current facilities cannot currently meet. 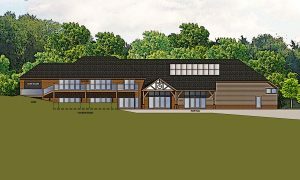 The requirement to create improved facilities to serve the hall space will inevitably generate a larger building than the current Village Hall on Hut Lane. The replacement hall will be served by a permanent stage area, a large store for chairs and other equipment, a small secondary meeting room and a kitchen/servery. Beyond this, the scheme will provide for a large covered entrance foyer with pram storage area, male and female toilets with a number of facilities commensurate with the size of the building, disabled WC facilities and baby- changing facilities plus space for plant and equipment storage. 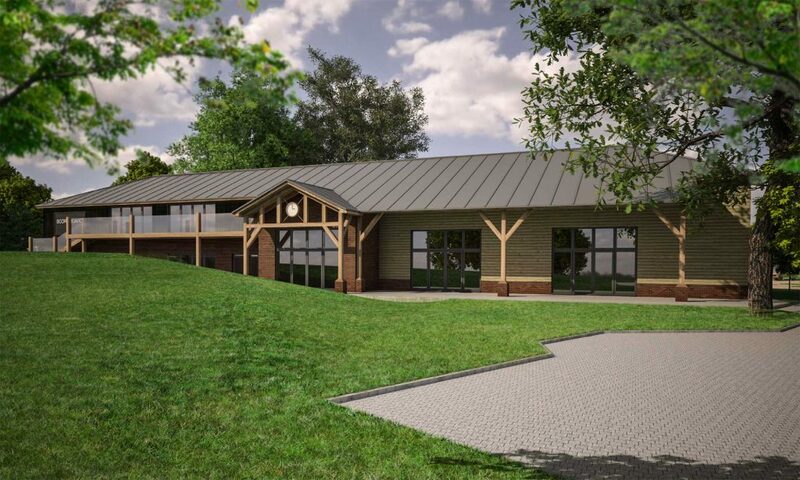 The Sports Pavilion element will contain two separate changing areas with shower and toilet facilities, plus a separate official’s toilet and changing area, a Pavilion Club Room with small kitchen and bar servery plus additional toilet facilities and a separate store beneath for grounds equipment. The layout has been specifically designed to provide the minimum amount of circulation space needed to link the various elements of the hall together, but does include staircase and lift facilities to the first-floor Club Room area. See later for design rationale. The existing Village Hall at Hut Lane has a total gross floor area of 291m2, of which 116m2 is formed by the main hall itself. The existing Village Hall site has been the subject of a scheme to demolish it and replace it with a residential development which has been approved under WD/2018/0089/O. Refer to Section 10.06 for further details of this proposal. The existing Sports Pavilion on the playing fields site is a two-storey structure, with the Club Room at first floor level set over the changing and storage facilities. The building has a total gross floor area of 101m2. The building as whole proposed under this application has a gross floor area of 890m2. The application site forms the north-east corner of Hadlow Down playing fields and runs adjacent to the western edge of School Lane. The existing Sports Pavilion is in the north-west corner of the site curtilage and lies adjacent to the footprint of the new development. The land to the west of the site curtilage opens up to form the playing fields and cricket pitch. Immediately north of the site lies open fields laid to pasture. The northern boundary is screened by a mature belt of indigenous trees with a wide under- storey hedgerow following the line of an existing drainage ditch. The eastern boundary against School Lane features a maintained hedge with individual trees set behind this. The southern boundary features a group of dense tree cover with under-storey growth forming the boundary with School House. The land slopes upwards from south-east to north-west with a rise from the School Lane side of approximately 2m. An existing drainage ditch bisects the site and beside the Sports Pavilion to the west, there are a number of individual trees which require removal to facilitate the development. The existing access from School Lane will be retained in its current position in order to avoid wholescale disturbance to the frontage boundary planting and to enable vehicular access to run along the southern boundary to serve the existing playing fields. The existing level area immediately beyond the eastern boundary of the site adjoining School Lane is considered to be most suitable to form the car park. This is because it adjoins the main entrance and is already used for this purpose at present. The new building will incorporate facilities to directly replace the existing Sports Pavilion. The current Sports Pavilion is ideally placed to serve the cricket pitch in terms of its position relative the pitch boundary and its outlook across the playing area. Therefore, the replacement facilities will need to be similarly situated, although there is a need to retain the existing building in use whilst the new one is constructed. 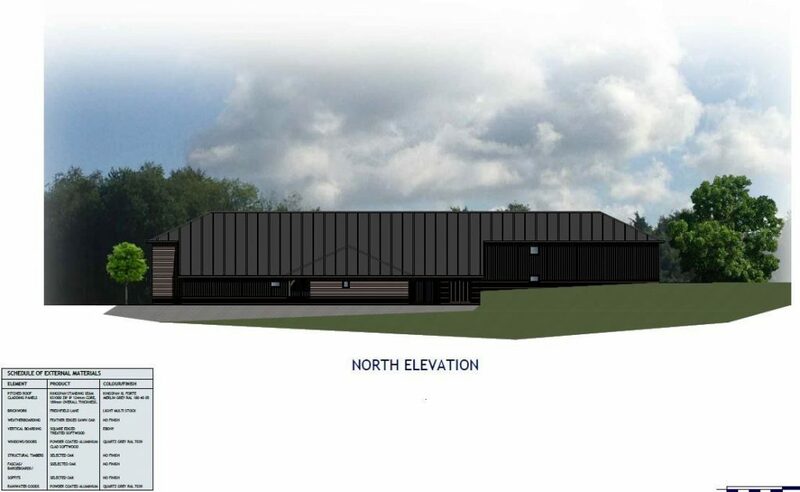 Therefore, the replacement Sports Pavilion facilities which form the north-western end of the new building will be located as close as practically possible to the existing structure which would then be demolished upon completion of the new development. Whether walking from the village or travelling by vehicle-based transport to the site, it was important to ensure that the optimum arrangement for easy access for all user groups forms an integral part of the building design. As such, the main entrance has been located directly adjacent to the principle parking facilities and forms the most prominent and visible part of the primary elevation. Disabled access spaces and level footway areas form an integral part of the design to link the access and parking facilities to the building itself. The substantial and mature indigenous planting around the boundaries of the site are considered to be of primary importance to provide effective screening of the development in wider views. Therefore, if the building was to be placed too close to the northern, eastern or southern boundaries of the application site, then its influence upon the trees might form an unacceptable relationship leading to pressure for removal. Therefore, the building has been located centrally, but to the western side of the available area thereby enabling the trees to be retained along the boundaries. From the relatively level area immediately beyond the access, the land rises up towards the Sports Pavilion. From an early stage, it was evident that to create all of the required accommodation on one level would generate a building footprint which would be difficult to accommodate within the area identified for the built form on the site. 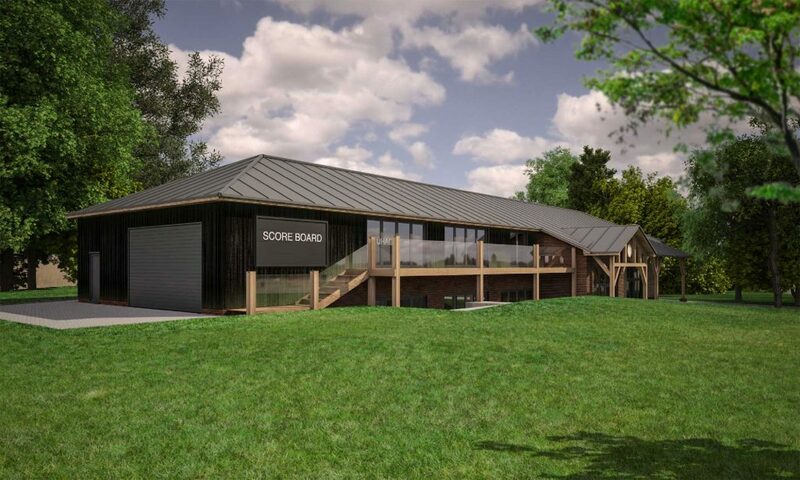 Therefore, the design makes use of the rising ground levels and creates an upper element at the Sports Pavilion end which will directly access onto the playing fields where the ground level is at its highest. The Sports Pavilion end of the building is therefore designed as a two- storey structure, set into the ground levels to minimise its overall height. 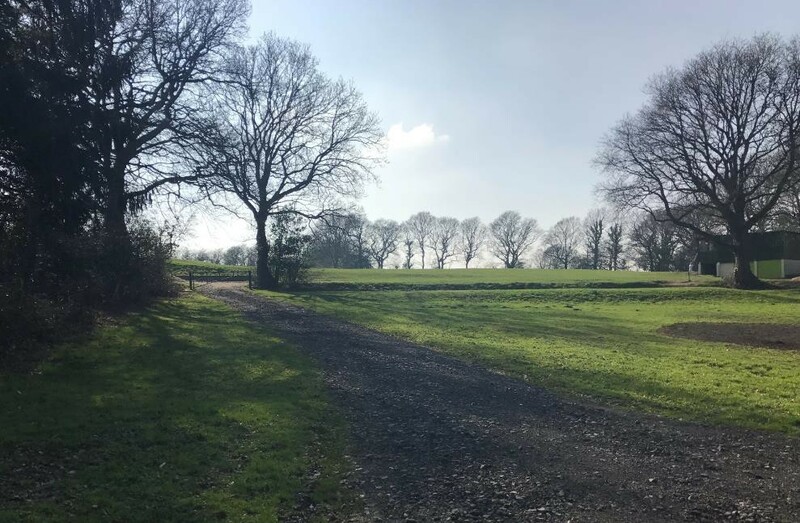 Set within the The High Weald Area of Outstanding Natural Beauty, the presence of existing boundary screening around the playing fields means that its presence in wider views is insignificant. The land slopes away to the north beyond the site boundary and the existing levels and dense boundary screening mean that views in to the site from most directions are largely impossible. Setting the bulk of the building down within the rising site levels means that the existing screening can be at its most effective, and from wider views it is anticipated that the presence of the new structure will be largely un-noticed, with the exception of its presence when viewed from School Lane to the east. With careful attention to the site levels throughout the development and the provision of a comprehensive scheme of additional landscape planting, the presence of the new structure when observed in wider views will create little change and limited visual impact. There are no properties directly north of the site within about 250m of the northern boundary. Whilst the wider landscape impacts are considered within the design as detailed in Section 4.03.1, in terms of overlooking, there is little impact in this direction. The land west of the playing fields is open countryside formed largely with fields of open pasture divided by shaws of indigenous trees and mature hedgerows. The nature of the existing ground levels means that the building when viewed from the west will be largely undetectable and in terms of impact upon adjoining properties of residents, there are no issues in this direction. 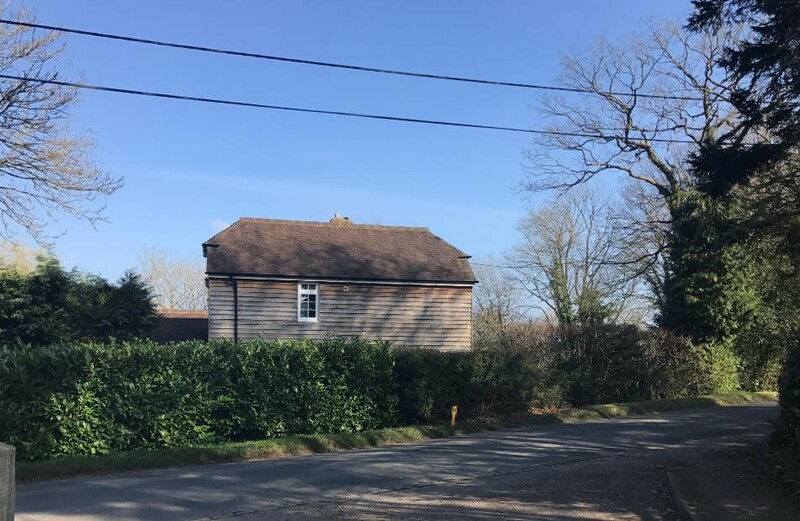 The only property directly south of the site, within close proximity is School House, a substantial dwelling set in a mature plot. The flank of this dwelling is approximately 30m from the southern boundary of the application site and substantial screening and a large woodland belt exist to the north and behind the property to the west. 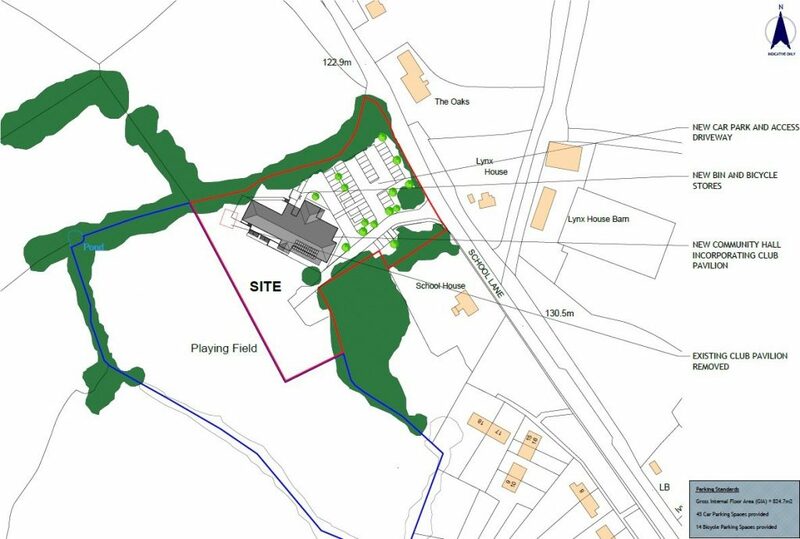 Therefore, direct lines of sight between the proposed development and School House are all but impossible and whilst it is accepted that general activity at the site may increase following the development, there is already established use of the playing fields and its facilities at present and therefore the level of change here would not be so great as to render the relationship between the two sites unacceptable. 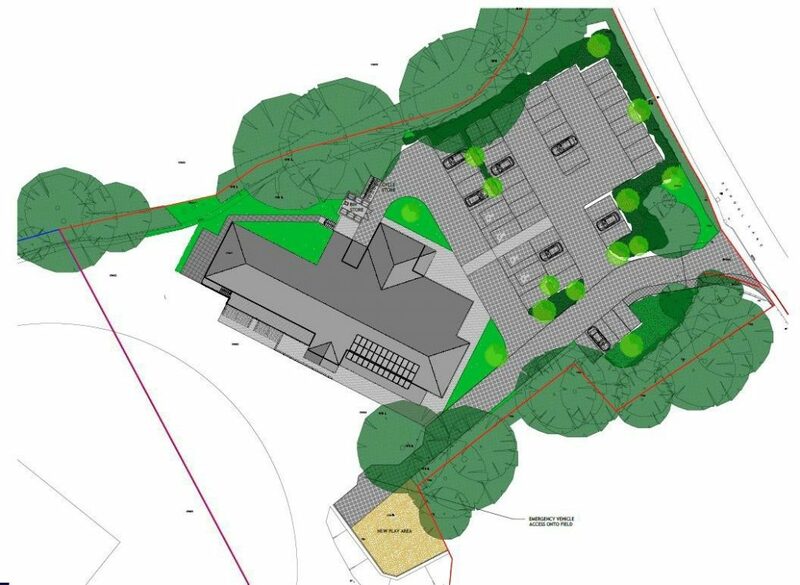 The dwellings perhaps most affected by the development will be Lynx House and The Oaks, both of which lie on the eastern side of School Lane, directly opposite the site. The new building has been deliberately orientated such that the primary fenestration and external activity associated with the use of the building will take place on the south-west side, directly away from these properties. Furthermore, the building has been designed to be of largely single-storey construction on the north-west side where it faces towards School Lane. Whilst the entrance area is here, it is well-screened by virtue of the roof design, careful use of ground levels and the provision of substantial landscape planting to supplement the existing tree and hedgerow cover which already exist. Nonetheless, the new building will be at least 68m from the front elevation of The Oaks and 69m from the front of Lynx House. It could be argued that the relocation of the children’s play area which currently falls directly adjacent to the front boundary of the application site will be of benefit to the residential amenities of both properties and through the introduction of additional landscape planting and careful attention to the timing of events, the level of impact created by the development is considered to be acceptable given the current site conditions and the established village location. Through the replacement of the existing Sports Pavilion with the new Community Hall project, it is accepted that there is a considerable increase in the amount of built form at the site. However, in creating accommodation on two levels at the western end of the building, the amount of footprint coverage is controlled and creates a more compact arrangement than would otherwise be possible if all the accommodation was created on one level. Since the new parking area will be located over the area currently occupied by the existing children’s play area and parking/turning area, the extent of the increase in scale of the external surface areas is controlled. Through careful design of the parking bays which are broken up through the introduction of planting beds and separating strips, the overall impact of the introduction of the parking area is softened. 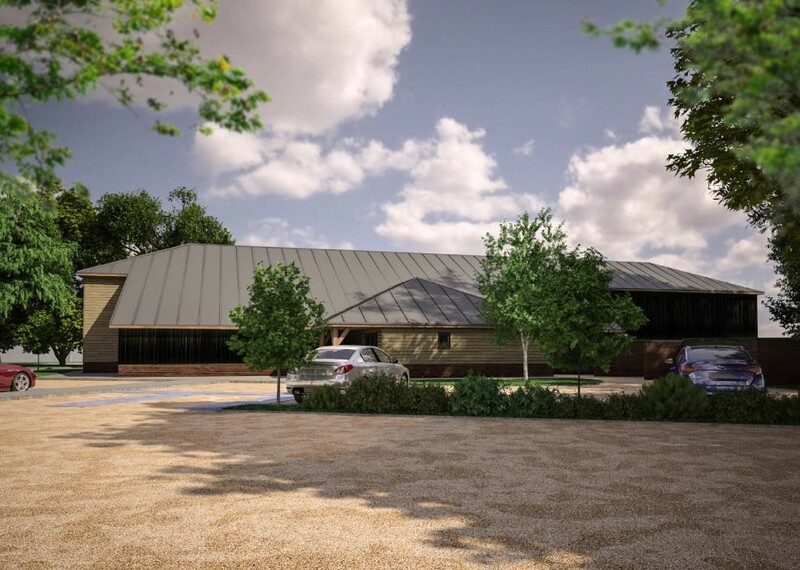 Due to the requirement to provide a fully compliant Community Hall in terms of its plan dimensions and clear headroom, it is inevitable that the resultant building will have a moderately significant scale. However, this has been controlled through careful design and modelling of the various elements of the built form and use of the naturally sloping ground levels to minimise the vertical emphasis of the two-storey element at the western end. Moreover, the decision to create a vernacular style which is relatively traditional and perhaps of agrarian origin, the resultant scale will inevitably read as quite significant in wider views. However, the secluded nature of the site and the use of varied eaves and ridge heights help to soften the impact of the introduction of the building into the site. The setting of the playing field site is established and well-screened in wider views, particularly to the north. From the outset, it was intended to keep the development within the constraints of the naturally screened site, such that it would be reasonably undetectable in wider views. Section 4.03 discusses the relationship with the setting in greater detail. Setting the building back from the highway and utilising the naturally sloping relief of the land helps to integrate the built form into the landscape. The site is well blessed with a number of mature deciduous trees and belts of mature tree cover and under-storey growth around its perimeter. A small number of individual trees will need to be removed within the centre of the site in order to accommodate the development in its optimum layout. However, the remainder will all be retained and supplemented through additional planting. A full Arboricultural Report accompanies this application. The building operations associated with this proposal are reasonably substantial. It will be important to ensure that the trees and wild grassland embankments to the east of the site which will remain are protected from the development as it continues and therefore, this application includes the provision of tree protection fencing specified in accordance with BS 5837- Trees in Relation to Design, Demolition and Construction and shown in detail on the application drawings. The opportunity exists to sensitively enhance the existing planting at the site and to close gaps in otherwise impenetrable landscape screens. In addition to this, the landscaping proposals for the development should be designed to soften the large expanse of the site and help integrate the new built form and replacement surfacing with sensitive tree and shrub planting. A detailed scheme of landscape planting has been included with this application which includes a number of indigenous trees, hedgerow planting and shrubs to help provide a rapid integration of the new development into its setting. A reasonable amount of metalled surface exists within the application site and forms the surface track to the playing fields and the small parking/turning area close to the main entrance. Beyond this, an overflow parking area is formed adjacent to the main playing fields and this area will now be occupied by the relocated play area. The new surfacing will be formed predominantly using permeable bitumen macadam. This will be broken up with connecting pathways, footways and specific parking areas formed in permeable block paving. 6.04.5 – Perimeter Paths and Terrace Areas. These will be finished throughout using high quality block paving. Surface paths and the apron in front of the equipment store will be finished in natural concrete. The origins of the nearby housing stock are varied and range from mid-Victorian to mid-20th Century. The adjacent property, School House has a formal Victorian character with later additions and is of brick-built construction under a slate roof. Lynx House has been subject to a number of improvements and additions and is of a Sussex vernacular with a mix of brick and weather-boarded elevations set under a tiled roof. The Oaks has been likewise extended and refurbished and features brick and tile- hung elevations under a tiled roof. These properties are all of two-storey construction and of reasonably substantial scale. The existing Sports Pavilion is a simple timber-framed structure set under a flat roof with a mix of painted blockwork to the ground floor elevations and painted timber cladding at first floor level. The building is entirely utilitarian in its composition and there will be no compelling case to retain it or replicate it in creating a replacement development. The sloping relief of the land has influenced the footprint of the building and not least the ability to create accommodation on two levels. The retention of the existing main entrance in to the site in its current position largely dictates the location of the main driveway in and out of the site and the resultant parking arrangements. The level area immediately adjacent to the access lends itself to the provision of parking facilities in this location. The land rises up towards the playing field area from the access and careful use of site levels will enable the use of the two-storey element of the building to be integrated into the site and minimise its vertical emphasis. 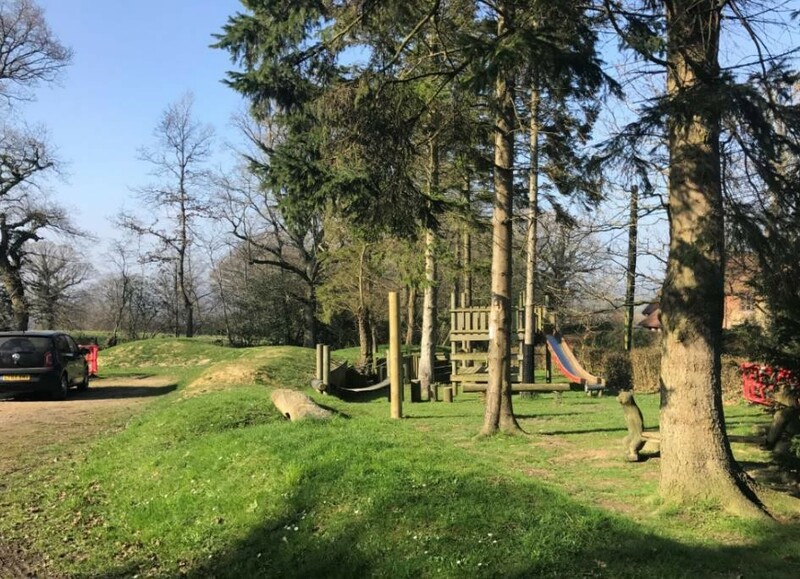 Existing trees – The retention and protection of the dense belts of tree screen cover on the site boundaries helps to form a natural enclosure and prevents intrusion into the High Weald AONB. A key requirement of the applicants and the management team was the ability to enable different user groups to use the facilities within the building at the same time. 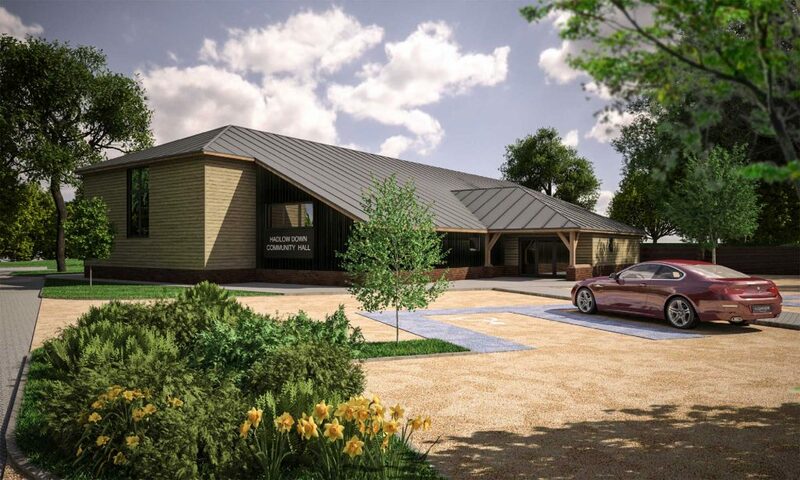 Therefore, the Cricket Pavilion and its changing facilities could be used independently from the Community Hall and smaller user groups could use the meeting room independently of the hall itself. With the playing fields opening up to the south and west, it would be logical to enable observation of activities taking place there from the building and this is possible on both building levels. However, at the same time, care has been taken to avoid the new structures being too visually dominant in terms of their glazing, balconies and other external features which may detract from the sensitive location. Therefore, the building has been set into the ground where the levels rise up to the playing field and the largest elements of glazing have been set beneath overhanging roof canopies in order to provide a high level of screening and avoid light pollution during night-time activities. 7.02 Materials, Styling and Detailing. Given the nature of the local vernacular and the design of the existing building at the site, there is little architectural reference which must be followed to create an appropriate form of development. However, whilst it was acknowledged by the Management Committee that a contemporary form of development could create an acceptable design solution, the rural nature of Hadlow Down village and its surrounds and the need to make sure that the building itself blended into the landscape as far as possible, the decision was taken to create a building form with a relatively traditional vernacular, set beneath pitched roofs. The function of the internal spaces within the Community Hall facilities requires good levels of natural light, numerous points of egress for general circulation and fire escape, and a reasonable amount of volume to the largest areas in terms of storey heights to achieve minimum clear headroom for certain activities. A simple design solution has evolved which relates well to the sloping relief of the land and utilises single storey elements with reduced scale and bulk to soften the larger elements of the scheme. The use of large overhangs to the roof form help to provide natural shading and avoid too much glare from the fenestration in wider views. During the design process, considerable debate was held over the choice of external materials. Clearly, the use of render or metallic-based wall cladding was felt in appropriate due to the likelihood of it being more visible in wider views beyond the site. Furthermore, the location of the building close to the cricket pitch meant that the roof structure and the upper wall areas were finished in materials which were durable and not susceptible to ball damage. Moreover, the Management team required the materials to have the longest possible lifespan with minimum maintenance. It was felt important to specify external materials from the outset. Often, schemes which are considered to be of good design are let down through the use of inferior or inappropriate materials. In order to eliminate these issues, the materials used on every element of the scheme have been fully specified within this application, in order to properly articulate every aspect of the scheme and to ensure a high degree of control over the finished development is introduced from the outset. Given its semi-rural location, Hadlow Down is largely reliant upon vehicle-based transport from wider areas. The A272 is the primary east-west link for this part of East Sussex and is served by regular scheduled bus services which stop in the centre of the village. The nearest available rail services are from Buxted, approximately 4km to the west which provide regular services to Uckfield to the south and East Sussex, Kent and London to the north. The current vehicle access in to the playing fields site is in the south-east corner of the application site. Its position will not change, but it will be adapted to improve the access geometry for safe access/egress for a larger number of vehicles. At present, School Lane is served by a narrow footway which leads down as far as the playing fields site. This will be extended around into the application site, adjacent to the main entrance. Whether arriving to the site on foot, by bicycle or other vehicle-based transport, the principal point of access to the main facilities is easy to identify at the site frontage. The new access and parking facilities adjoin the access road and create level set down areas for drop-off, plus parking facilities including disabled spaces with level walk to the points of entry into every part of the building. The principal entrance of each building is easy to identify with a well-marked and level approach to the main entrance door. All secondary access doors are also reached via a level footway. At present, a small metalled area exists close to the site entrance to provide parking and turning for approximately 10 vehicles. These will be displaced to accommodate the new development and car park. 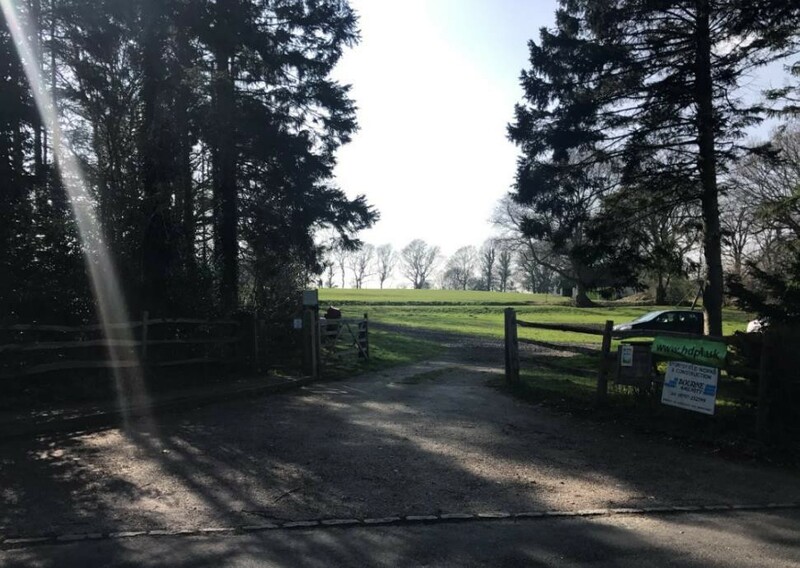 A new driveway will be formed from the existing site access which leads along the southern side of the new parking area and provides vehicle access to the parking spaces and the hall itself, plus service and emergency access to the playing fields to the west. The parking provision has been geared to comply with the requirements of East Sussex County Council Highway Authority and a total of 43 permanent spaces will be provided and with access to the playing field area further overflow space can be provided if necessary on the fringes of the playing field itself for specific events during summer months. Within the parking provision, the requisite number of disabled spaces is provided and 20% of the total parking provision will be fitted with electric car charging points. Whilst considered to be a rural location, it is entirely possible to access the site on foot and by cycling. At present, given the nature of the existing Village Hall, the vast majority of village users are already well-used to gaining access to the community facilities on foot. It is anticipated that they would continue to do this at the new site and the Management Committee will continue to actively discourage vehicle-based transport for those using the new facilities from within the village. Secure lockable cycle stands are provided in a primary location at the front of the site and the level of provision has been deliberately geared towards a higher than average use of facilities by those cycling to and from the site. All principal points of access are generally covered and will be designed to provide level thresholds and door opening widths which full comply with Part M of Building Regulations. Most of the accommodation provided within the building is located at ground level and is designed to meet and exceed the requirements of Building Regulations Part M. This includes Disabled WC facilities and dedicated changing facilities for users and visitors with mobility issues. The facilities provided within the replacement Club Room/Pavilion at first floor level will be accessed by a DDA compliant lift, formed within the structure and set within an area which can always be accessed, even if the main Community Hall is closed or engaged for another purpose. Both the National Planning Policy Framework (NPPF) 2018 and the Draft Wealden Local Plan 2018 policy documents seek to ensure that new development is sustainable in terms of its energy use and carbon emissions. Whilst no specific performance standard relating to community development has been set, the latest Building Regulations have introduced improved levels of thermal efficiency to the building fabric of all new buildings in order to limit energy use and control levels of air permeability. The Building Research Establishment Environmental Assessment Method (BREEAM) are useful targets when assessing the performance of a community building and the proposed development under this application will seek to achieve a status at least to Good/Very Good levels. Therefore, a ‘Very Good’ standard is considered to be an attainable level in the case of a modern development of this nature. The new development will be designed and constructed to meet and exceed the requirements of the latest Building Regulations in terms of thermal efficiency and carbon emissions. The fabric construction will comprise a supporting frame, most probably of steelwork, but the nature of the construction and varying uses and storey heights will mean that the development is likely to comprise a mix of supporting steel frame for the larger open-span elements with an external envelope of load- bearing masonry throughout and a pre-cast concrete structure for the first-floor element of the Club Room/Pavilion. Not only will a heavy masonry construction contribute to the thermal mass of the overall structure, this form of construction is also of benefit when considering the sound reduction and acoustic qualities of a community development of this type and a heavy-weight construction such as this will help to avoid leakage of unwanted sound into the wider environment. The roof structures will be formed generally using a steel framed roof structure, finished with insulated composite cladding panels. The internal building services will be designed to be as environmentally friendly as possible. Use of low energy consumption fixed lighting, system controls for lighting, heating systems and other appliances and provision of A rated white goods throughout. As part of the services design, it is a requirement to consider sustainable and renewable forms of energy generation on the site in order to meet the performance criteria stipulated under Building Regulations and to create a sustainable form of community development. Careful consideration of such provision has been made from the outset and the following measures can be incorporated into the building fabric without detracting from its visual appearance. These provide a relatively simple but highly effective method of generating electricity from natural light. Often the provision of PV panel arrays is an afterthought in the design process, but in this case has been considered from the outset. The large pitched roof over the proposed Community Hall provides a an appropriate surface for mounting in-line low-level PV panels. These could provide approximately 9kW of power generation which would be an extremely useful contribution to the sustainability credentials of the development. These units harness warm air from the atmosphere and in some cases, exhaust air from the air extraction systems and create heat for space heating and hot water generation systems, via a series of highly efficient heat exchangers. Air-to-air source heat pumps can also be employed to provide space heating and comfort cooling for specific areas of the building instead of unsightly and inefficient conventional air-conditioning systems. It is quite rare to have a development where the external space is not at a premium and could accommodate a wider range of renewable energy options. In this case, the provision of a ground source heat pump loop beneath the playing field area could provide an important method of energy generation for space heating. Whilst the energy use of these systems can sometimes be questioned in rural areas due to the amount of electricity required to power the heat exchange units, the use of a ground-source system in this instance would appear to be a good fit and, if approved, further work can be undertaken to ascertain the viability of such a system. The justification for this development in planning terms is set out below. The information should be read in conjunction with the Report to Inform the Habitats Regulations Assessment, prepared by AECOM Infrastructure and Environment UK Ltd and the Transport Statement prepared by Monson Engineering Ltd. When this project was first conceived, the Management Team explored the possibility of creating the project under a Community Right to Build Order (CRTBO). This process enables the proposal to be approved for development, without a full planning process. However, it does create a number of issues and constraints which may ultimately lead to a more inflexible decision in terms of the ability to create amendments as the scheme unfolds. Whilst the process is reliant upon gaining the consent of one individual independent examiner, rather than a Planning Committee, the process is also subject to the requirement to hold a Community Referendum upon the final outcome. After detailed consultation with various parties, including the local Planning Authority, it was concluded that the route to obtain consent for the development would be more flexible and perhaps more expedient using the conventional Planning Permission process. Detailed discussion regarding this requirement and its appropriate assessment are both covered in some detail in the Report to Inform the Habitats Regulations Assessment prepared by AECOM. It concludes that the appropriate assessment procedure undertaken by the competent authority, in this case Wealden District Council, would be able to conclude that the project would create no adverse effect upon the integrity of the Ashdown Forest SPA/SAC either by itself or in combination with other developments, even in the light of the issue of the Draft Wealden Local Plan 2018. NPPF 2018 2.8b – A Social Objective – To support strong, vibrant and healthy communities with accessible services and open spaces that reflect current and future needs to support communities’ health, social and cultural well-being. NPPF 2018 13 – To encourage communities to engage in neighbourhood planning. NPPF 2018 20 (c) – Development plans should make provision for community facilities (such as health, education and cultural infrastructure). NPPF 2018 83 (d) – The retention and development of accessible local services and community facilities (including meeting places, sports venues, open space and cultural buildings). Throughout the private and public consultation processes, the pre-application meetings with the Planning Authority and through the design process itself, every aspect of the policies mentioned above has been addressed. 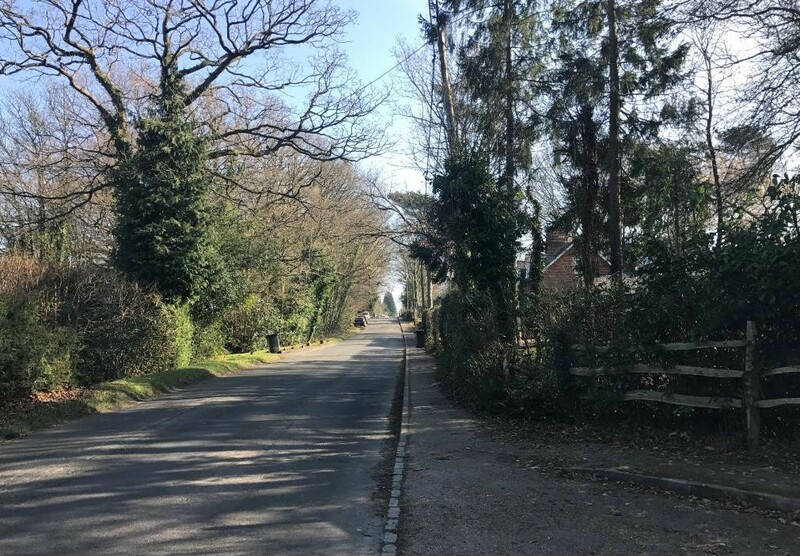 The process has been subject to two public meetings and numerous informal consultations where feedback has always been considered and where appropriate, implemented upon to adapt and refine the design proposals to meet the needs of the Hadlow Down community. With the existing Village Hall being at the end of its service life and in an unsuitable form for improvement to serve an increasing number of community groups and to provide the required access facilities for all user groups, with the requisite access and parking facilities, it would seem logical to relocate a new development adjacent to the existing playing fields in order to enhance the use of these and to create a fully compliant community development unconstrained by its location. The detailed and positive pre-application advice given by the Local Authority has also helped to shape and mould the detail of the final scheme. In June 2018, Wealden District Council issued its Draft Wealden Local Plan 2018. Whilst not adopted, the LPA has made it very clear that the Draft Plan will carry significant weight in the determination of applications immediately following publication and whilst any development proposal can still be measured against the current statutory policy instruments, including the saved policies of the 1998 Wealden Local Plan and the Wealden Core Strategy Local Plan 2013, the application proposal here is measured in more detail against the latest policies available. Of particular relevance to this scheme are the following policies. To encourage the development of high-quality safe and attractive living environments for communities both in towns and villages, whilst promoting local distinctiveness in all new development. 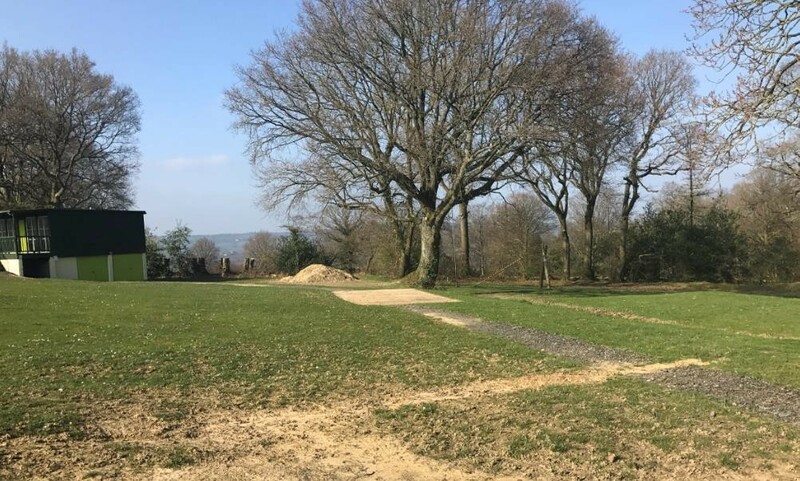 To deliver controlled development with mitigation measures to protect the specified sensitive sites, most notably the Ashdown Forest Special Area of Conservation. Note that this subject is dealt with in detail in the AECOM report submitted with this application. Measures to mitigate the development are incorporated directly into this scheme. For the most part, the development is a direct replacement of existing facilities already present within the village, most notably the existing Village Hall at Hut Lane and the Sports Pavilion at the application site. In addition to specific mitigation payments which may be applied by the Local Authority to offset the impact of the development, the scheme itself incorporates measures such as the provision of electric car charging points within its parking facilities. Measures to protect the impact of development on the Forest within the 7km boundary assessed on case by case basis – refer to AECOM report. This seeks to enhance Community Hall facilities within Parishes where there are identified deficiencies created by housing growth. 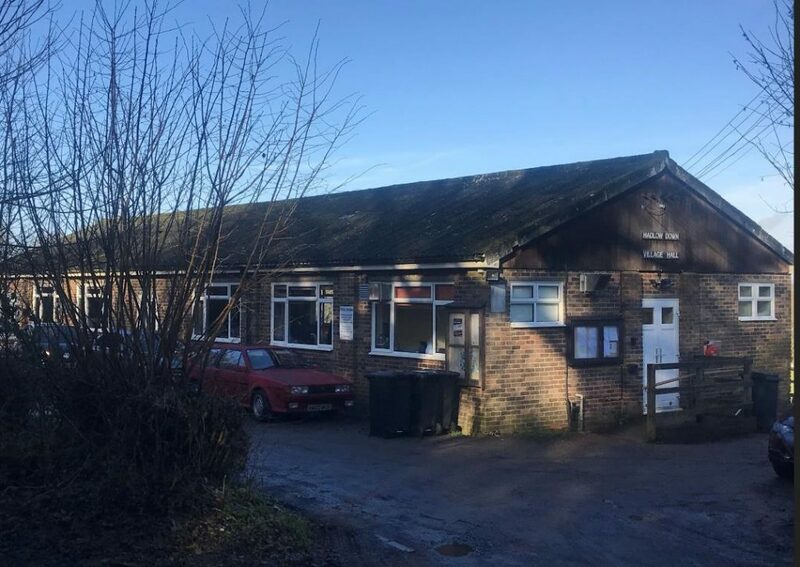 Whilst the projected housing figures for Hadlow Down have been limited under the new strategy, the existing Community Hall provision delivered by the current building is deficient for the village as a whole in its current form, let alone any future growth. This policy seeks to ensure that facilities are provided in appropriate locations within development boundaries or are accessible by walking and cycling to and from the main part of the settlement. Design requirements include the ability to share facilities by different organisations and services and to be capable of being extended to meet future needs. Design should be prepared with regard to Sport England’s Design Guidance Note (2001) ‘ Village and Community Halls’. There is a requirement to create adequate parking provision for current and future growth potential. The loss of existing facilities will be resisted unless it can be demonstrated that the facility is no longer required to meet current needs, or an alternative and improved version can be made nearby in a location that is accessible to local people. In the case of the existing hall at Hadlow Down, it has been demonstrated that the existing building is at the end of its service life and cannot be adapted, extended or replaced on its current site to provide the required Sport England compliant specifications. 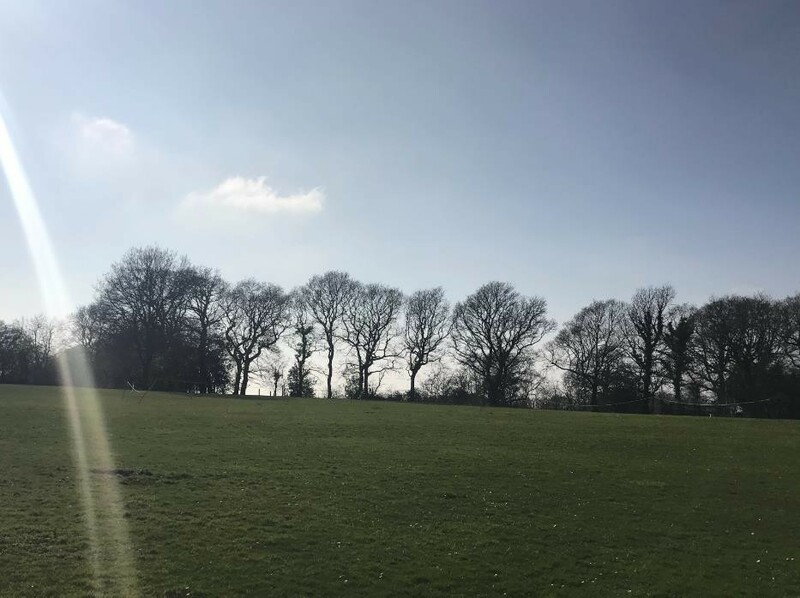 The alternative location proposed by this scheme, adjacent to the existing and established playing fields facilities serving the village means that the community and recreational facilities for Hadlow Down will be accessible to local people, just as they are at present. x. WLP 2018 – Policy NE1To avoid creating unacceptable levels of noise and light pollution from new development. To create external lighting schemes which are compliant with the criteria and protections afforded by the International Dark Sky Association and are compliant with the requirements to avoid unnecessary light infiltration likely to affect the High Weald AONB. Through the Pre-Application Advice process and subsequent discussions with the Case Officer following the publication of the Draft WLP 2018, it would appear that the policy benchmarks created by the emerging policy document can all be met and satisfactorily addressed through the detail of this proposal. A detailed Pre-Application Advice meeting was held between members of the Village Hall Management Committee and Senior Planning Officer and Doug Moss, on Tuesday 21st November 2017. The meeting covered all aspects of the development proposal, including the assessment of whether to follow the conventional planning route or the Community Right to Build Order for achieving statutory approval for the scheme. 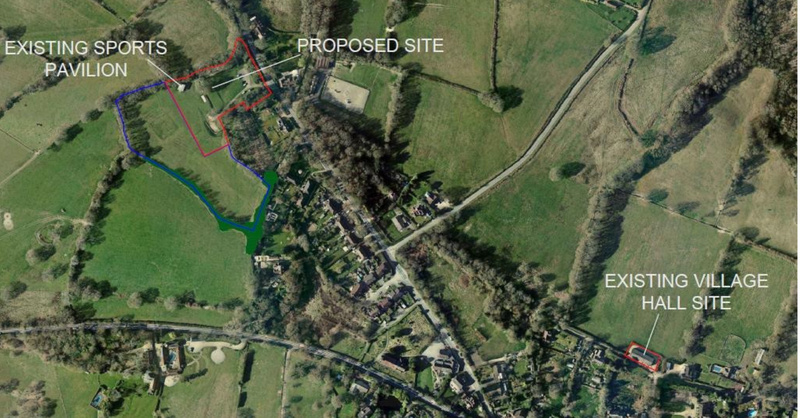 In addition to this, an an assessment of the development proposal itself and that of the existing Village Hall site at Hut Lane, where it was proposed to replace the existing building with a small-scale residential development. In the context of the new Community Hall proposal which is the subject of this application, the advice was generally positive and that subject to supplementing the details of the scheme, the design principles and the nature of the development were all well-received and deemed acceptable in principle. The Village Hall management team have undertaken numerous consultations with interested parties. A number of informal meetings have been held between members of the Parish Council, but the two primary public consultations have been in the form of public meetings held at the existing Village Hall during the course of 2017 and 2018, where the scheme was presented in detail to local residents and detailed interactions, including workshop sessions were held to obtain feedback about the use of the building, design and layout and the principle of development itself. This generated a number of interesting responses and where appropriate, these have been incorporated into the final scheme. An entire section of the Community Hall development has been created on the Parish website, giving background to the requirement for the development and its evolution to this point. The design of this development has been prepared with its setting firmly at the forefront. There are no designated heritage assets in terms of existing built form within close proximity of the site. The site does lie within the High Weald AONB and as such, careful treatment has been given to every element of the design process to ensure that its impact upon the setting is kept to a minimum. It is accepted that one of the key issues surrounding development on this site will be the impact of additional traffic generated by the Community Hall and enhanced facilities. The Transport Statement included with this application as prepared by Monson Engineering provides detailed information about traffic movement, trip generation and comparison with the existing arrangement. It concludes that the levels of impact upon the site and its surroundings will be minor. This is also discussed in detail in the AECOM Report to Inform the Habitats Regulations Assessment. The creation of much improved parking facilities within the site will help to avoid issues of parking in unauthorised areas and the fact that the proposed development will be located on the fringe of the village in an area already designated for public use as playing fields and served by the existing footway network will help to ensure that the majority of user groups and individuals who access the site from the village will do so on foot or by bicycle. A full Arboricultural Assessment has been prepared which recognises the presence of the existing tree screens and provides details of measures for the protection of the trees during the construction process. In summary, there will be very little change on the site since only one or two moderate quality trees require removal in order to facilitate the development and the measures taken to introduce extensive additional landscape planting to screen the development are considered to provide ample mitigation for their loss. An Ecology Report has been prepared in conjunction with the Arboricultural Assessment and is included within this application. There are no specific constraints to development in this regard and the suggested mitigation measures will be incorporated into the final detailed scheme. The site lies outside the recognised area of flood risk and is set within a Zone 1 (Low Probability) area. Furthermore, the site area falls below the threshold for a mandatory FRA and therefore has not been included within this application. Further details of the drainage proposals for the site and the parking areas can be obtained from the Drainage Strategy Report prepared by Monson Engineering. In summary, all new parking and surface areas externally will be formed using a permeable paving system and run-off from the building itself will be dealt with by means of attenuation and discharge to the ground by means of soakaways with the addition of an overflow outfall to the existing unclassified drainage ditch on the northern boundary of the site. The final detailed proposals of the drainage system would be subject to final porosity testing at each soakaway location at the appropriate stage prior to development and it is considered that surface water drainage can be adequately dealt with within the confines of the site and controlled by planning condition. At present, there is no foul drainage connection serving the site. There are no public foul sewers within reasonable proximity of the site and in order to service such connection, a substantial pumped main system would be required. A proposal of this nature would prove to be prohibitively expensive for a scheme of this nature where the budget is always a key constraint. Therefore, the proposals for dealing with foul drainage will comprise the creation of a packaged sewage treatment plant, located at the site with an outfall to the adjacent unclassified drainage ditch network along the northern boundary. In 2013, the applicants commissioned the preparation of a Geotechnical Investigation on the site and this was undertaken by Southern Testing Laboratories Ltd.
Whilst the report is considered now to be too old for inclusion with this application, its results did confirm that the ground conditions were entirely suitable for undertaking a development of this nature at the site, subject to final design to accommodate ground-bearing capacity and the proximity of nearby trees. BRE Digest 365 soakaway tests were also undertaken which confirmed that, in principle soakaways would work on site, albeit with relatively low soakage rates, but detailed design would accommodate these. The report did not specifically undertake a detailed contamination assessment, but the samples taken from the grid of boreholes taken across the site did not show any presence of contamination and the previous history of the site would lead to concluding that the probability of contamination being present at the site is low. Nonetheless, it is anticipated that the Local Authority will impose suitable conditions requiring the provision of up-to-date porosity tests for any soakaway design and a mechanism for the identification and remediation of any contamination identified during the course of the detailed design and development process. Planning policies and development control measures rightly exist to ensure that levels of noise generated by community facilities of this nature are controlled. The design and layout of this development has been carefully prepared to ensure that the majority of openings serving the public facilities within the building are set on the south/south-western side of the building. This brings the levels of activity as far away from the nearest properties as possible, albeit that significant distances exist between the building and the nearest dwellings – Refer to Section 4.03.2. The building itself will be constructed from a substantial masonry construction and will include high-specification windows and doorsets which will achieve good levels of sound reduction. However, at this stage it is not possible to fully confirm the precise nature of these until the detailed technical design can be funded and undertaken. Therefore, it is anticipated that the LPA will impose suitable planning conditions requiring the provision of such information prior to the commencement of development. Perhaps the most useful means of controlling the levels of noise and activity at the site will be to consider appropriate controls on the hours of use and perhaps the frequency of large events. If minded to do so, and following detailed consultation with the Village Hall Management Committee, the LPA may impose appropriate conditions controlling the hours of use of the building, particularly those occurring at night and at weekends. Whilst a key aim of the development will be to allow community user groups to arrange regular activities and functions, the need to control the frequency of these may by an issue for the LPA and if minded to do so, following detailed consultation with the Hadlow Down Community Centre Committee, suitable conditions controlling the frequency of large public gatherings and the nature of these may be applied. Given the secluded nature of this development and the fact that, whilst within the AONB, its impact is extremely limited and that part of the proposal is to effectively replace a two-storey structure which is already present on the site, it is not considered that a full LVIA is required at this point. Detailed mitigation measures for the design and layout of the development have been described within this document in terms of the building design, site levels and landscaping. These are all factors which would normally be identified by an LVIA process. 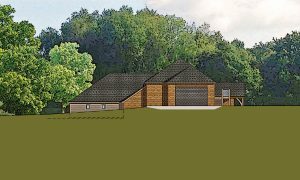 Two applications were submitted to Wealden District Council seeking to, in theory, extend the size of both the existing village hall and playing field pavilion. 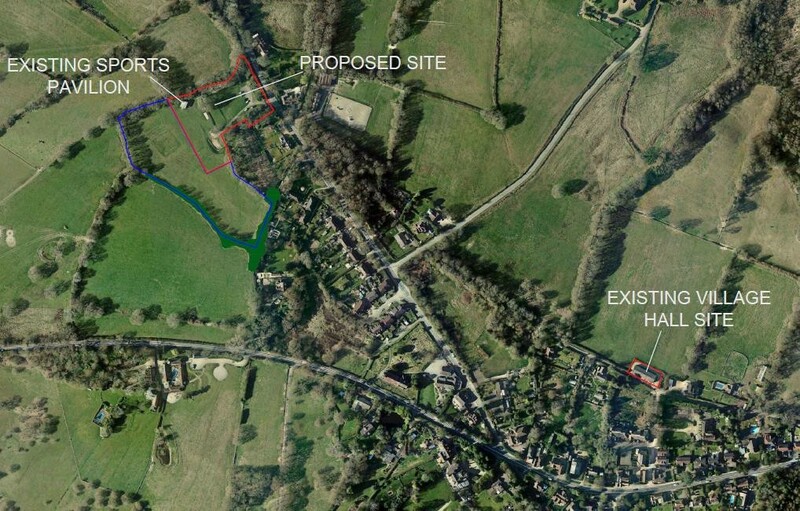 We followed a process known as ‘Lawful development (proposed)’ which is more commonly referred to as permitted development.In very simple terms, what we did was to produce basic/outline drawings and submit these to Wealden District Council and ask them to confirm that the suggested proposals would be permitted development. We had limiting factors to consider; to comply with schedule 2, part 12 Class A of the Town and Country Planning (General Permitted Development) Order 1995, the notional extensions had to be less than 4 metres high and 200 cubic metres in capacity. 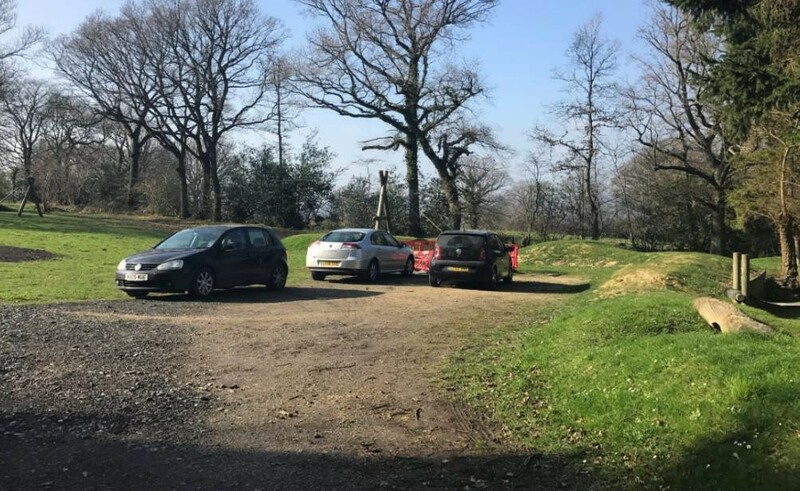 We had also been advised previously by the council’s planning department that the existing buildings could only be increased by about 30% in floor area if they were to comply with the new rules regarding the Ashdown Forest special protection area. Our proposals complied with all these parameters and the applications were “approved” on the 1st May 2014. We have gone through this process so that we can use the existing and theoretical (but approved) extension floor areas when designing the new, combined hall and pavilion. This avoids us having to justify any increase from the existing building areas so that we can concentrate on other aspects of the proposal such as the appearance, layout and siting. Although at present there is no intention to construct the permitted development extensions, it is nice to have a fall-back position should that ever be necessary. 1.1 Storage: to cater for tables, chairs, short mat bowls, dancing mats, costumes, scenery, small movable gymnastics apparatus (benches, mats etc – only relevant should St Mark’s wish to use the hall during the school day). Sport England Guidance note ‘Village & Community Halls’ recommends a storage area of 40m² to support a badminton court sized main hall space. 1.2 Pavilion storage: Grounds maintenance machinery (mower, mechanised cricket roller), materials i.e. loam, seed, Summer Fayre equipment. Current undercroft spaces measured as 35.04m² but lacking in height – Work on a minimum of 70m² which is approximately double the size of current storage areas. 1.3 Small storage area for cleaning equipment, materials etc. Access to the combined facilities. 2.2 Height to be sufficient to allow for adequate headroom over the raised level stage and seated area for lighting bars and screen. 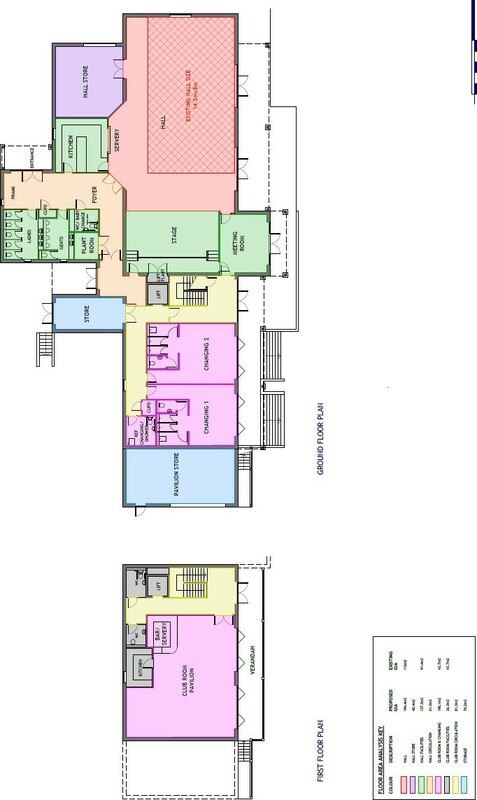 3.1 New kitchen to be bigger than existing village hall kitchen – possibly double the size. 3.2 Separate small kitchen for pavilion – perhaps similar to the existing one. Position the main kitchen to allow for dual use without accessing the hall. 3.3 Toilets for the hall: WC’s – suggest ladies = 4 x WC, 2 x basins; Gents = 1 x WC, 3 x urinals, 2 x basins plus disabled facility – all as a minimum. 3.4 Changing rooms: for the pavilion and backstage areas, the former will have to comply with English Cricket Board (ECB) Technical Specifications given that 22 adults will be involved with cricket bags; therefore a greater area will be required. The ECB Guidance note ‘Pavilions & Clubhouses (TS5) requires 20m² for each changing room, 3 shower heads per changing room and a minimum of one toilet and basin per changing room. We would suggest two. There are no technical specifications for changing areas for the arts. 3.5 Hall (backstage only) and pavilion changing areas/wc’s are to be shared. The changing room areas can be sub-divided with the use of partitions to create 4 smaller areas – one each for adult males and females and likewise for boys and girls. 3.6 Committee room: to be combined with the sports club room. The current Committee room in the village hall has an area of 30m² (8.055m x 3.734m) – suggested area to be 45m² i.e. 50% more. 3.7 General: to have viewing area for the field/pitch. 4.1 Budget: initial suggested budget in the region of £750k. 5.1 Parking provisions are to be discussed and agreed but to some extent justified by the following: existing possibly 10 around the hall, 6 in Hyders, 5 left-hand side of lane, 10 in Hidden Cottage field, so a total of 31 to match this for the hall plus 10 for the pavilion to match existing usage – 41 in total. During 2012 Wealden District Council produced its Core Strategy. This forms part of a wider set of local planning policy documents known as the Local Development Framework (LDF). However, in the north of Wealden, is situated Ashdown Forest – an area designated as a Special Area of Conservation (SAC) and also a Special Protection Area (SPA). The position of WDC is that any development within the 7km radius which would increase recreational and traffic pressures upon these European habitats must mitigate its own impact. On 18th February 2013, the Chairs of the Parish Council and HDCC met with Cllr Roy Galley (WDC) at the playing field site. At the time Cllr Galley was the Portfolio holder for Planning and Development. The opportunity was taken to explain to him the detail of the project, particularly our intention to relocate the new hall onto the lower part of the playing field, to demolish the existing sports pavilion and incorporate new sports facilities into the new hall/community centre. Also the impact of the 7km zone on the development of the project was discussed. The meeting concluded with Cllr Galley stating that “Hadlow Down will have its new hall”. Rachel Lewis “Vice Chair. Experienced fund-raiser with Lottery and charitable trust funded projects. Nigel Harrison “Chair of Build & Design Sub-Group & Trustee.